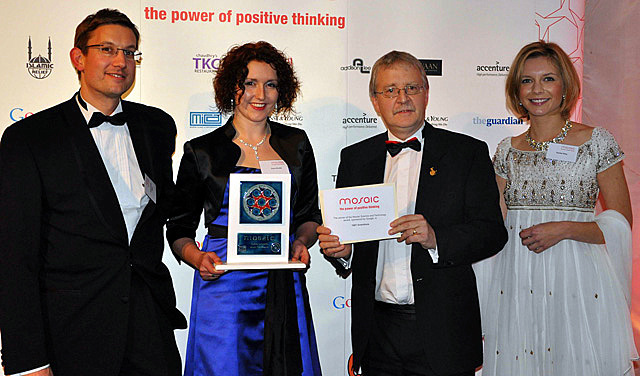 23rd November 2010, London: The 1001 Inventions brand has been presented with the prestigious Science and Technology Award at an awards ceremony organised by Prince Charles’ Mosaic charity at a glittering ceremony in London. More than 400 guests attended the gala event hosted by the BBC’s Mishal Husain and Asad Ahmed and attended by HRH Prince El-Hassan bin Talaal of Jordan and his family. From left to right Torsten Schuppe (Google UK), Fiona Scoble (1001 Inventions), Peter Fell (FSTC) and Rachel Riley (‘Countdown’ presenter). 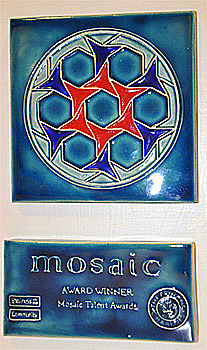 The Mosaic Talent Awards are organised by the Mosaic charity, which was founded by HRH The Prince of Wales in 2007 with the aims of creating opportunities for understanding between different people and groups and to create opportunities for young people of all backgrounds who do not have them. 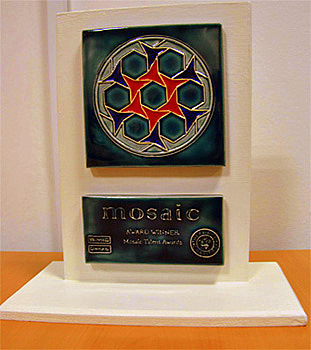 This year is the second time the Talent Awards have been presented following the success of the inaugural event in 2008. 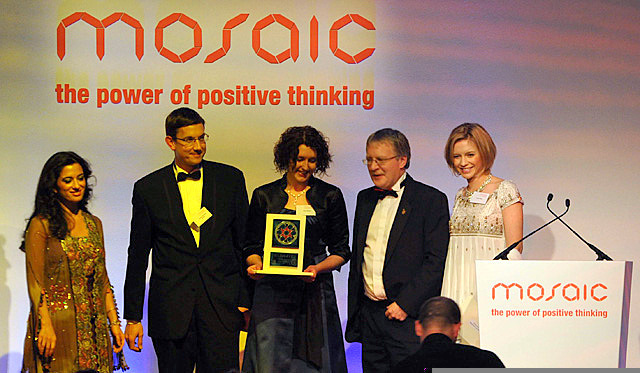 The 2010 Award for Science and Technology is sponsored by Google and was presented to 1001 Inventions by the Chairman of Mosaic, HRH Princess Badiya bint El Hassan of Jordan, who was joined on stage by Rachel Riley from the Channel 4 programme ‘Countdown’ and Torsten Schuppe of Google UK and Ireland. From left to right HRH Princess Badiya bint El Hassan, Torsten Schuppe (Google UK), Fiona Scoble (1001 Inventions), Peter Fell (FSTC) and Rachel Riley (‘Countdown’ presenter). The 1001 Inventions exhibition is currently on a five-year global tour and, following blockbuster runs in London and Istanbul, it will enjoy its North American Premiere at the prestigious New York Hall of Science (NYSci) on the 4th of December 2010.